In the upper Gunpowder, we filed a petition for judicial review in Circuit Court on the Maryland Department of the Environment (MDE) discharge permit for the Hampstead Waste Water Treatment Plant. 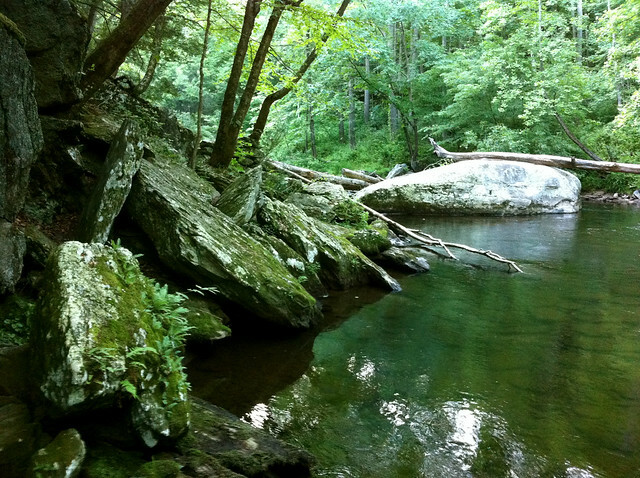 The conditions of the permit were weaker than the previous permit allowing water temperatures higher than state water quality standards that protect wild trout streams. 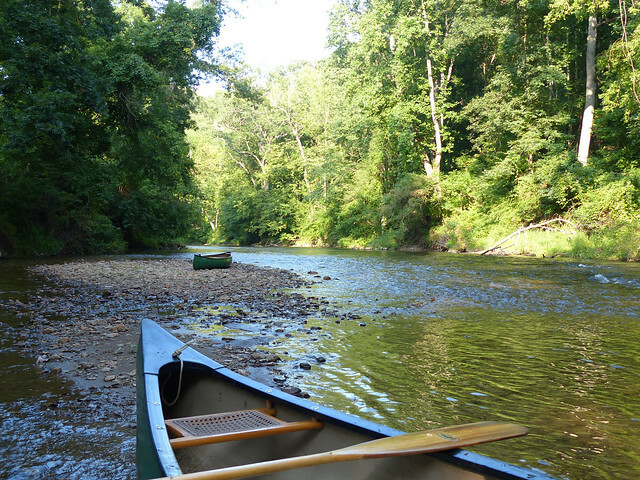 This facility discharges directly into Piney Run that joins McGill Run and forms the Western Run, notably one of the best wild trout streams in Baltimore County. In the lower Gunpowder, we are tracking a proposed Tire Pyrolis Plant after being approached by a number of members and residents who are very concerned about the potential for impacts in their backyards. We are currently working with concerned citizens and the relevant companies to increase public engagement and knowledge about this proposed project. Our legal research for the Hampstead Waste Water Treatment plant uncovered 119 violations of its discharge permit for various pollutants including temperature, phosphorous, nitrogen bacteria and ammonia all upstream of Baltimore City’s drinking reservoir, Loch Raven. We testified before the Harford County Development Advisory Committee against a Royal Farms project that would allow tanks with the capacity of 60,000 gallons of fuel to be placed within the critical area of the Chesapeake Bay despite concerns about the potential for community and environmental impacts. We protected Bush Cabin Run, a known Brook trout tributary by identifying an out of compliance in-stream construction project. Approximately 9, 925 square feet of area in, along and upland of the stream was disturbed which resulted in the Maryland Department of the Environment (MDE) issuing and enforcement letter to the Maryland Department of Natural Resources (DNR) which has since stabilized and replanted the impacted area. We identified invasive New Zealand Mudsnails in the Upper Gunpowder River and DNR fisheries issued an alert about cleaning and disinfection methods to contain the snails. We sponsored an Eagle Scout project that provided outreach maps across 18 miles of River that highlighted fishing regulations, recreational interests and drinking water supply information. Riverkeeper hosted 65 Brownies on a streamwalk to connect wild trout habitat with drinking water for a Wonders of Water Journey. Riverkeeper testified at EPA headquarters opposing the rollback of the Effluent Limit Guidelines, “Fly Ash Rule” that regulates the discharge of these known carcinogenic materials in the Lower Gunpowder. Our work in asking for stronger permit conditions for the MDE permit on C.P. Crane Powerplant was featured in the Wilderness Society’s, “False Promises, Why Coal Isn’t Coming Back” study and may have led to the facility filing a deactivation notice to the grid for plant operations. We reviewed the Lower River fish kill study by MDE and DNR and asked the agencies to conduct more baseline monitoring to assess actual pollutant loads prior to these events. 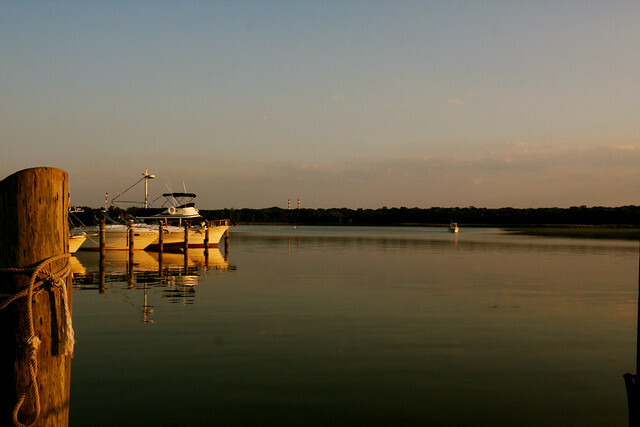 Opposed changes to the Endangered Species Act that would leave implementation to the states, relax the “best available science” standard, while delaying judicial review; Opposed Maryland SB314 that proposed to siphon up to $10 million annually from the Bay Restoration Fund (BRF) that has supported upgrades to 49 major wastewater facilities in order to purchase undefined nitrogen and phosphorus credits; and Opposed Executive Order 13777, “Enforcing the Regulatory Reform Agenda,” that would have revoked or significantly altered protective environmental regulations. This entry was posted in news on November 27, 2017 by Theaux Le Gardeur. In the latest collection of essays and fishing tales by Jerry Kustich the title story depicts the potential desecration of the pristine Holy Water section of Michigan’s fabled Au Sable River. As in his other books Kustich takes us on an insightful journey of happiness and sorrow with words that are as humorous as they are thoughtful. From Montana to Russia to Mexico to Newfoundland and beyond Kustich emphasizes that wherever we go to seek fish, on so many levels, all water is holy. This book is a journey well worth taking. This entry was posted in events, news on November 27, 2017 by Theaux Le Gardeur. 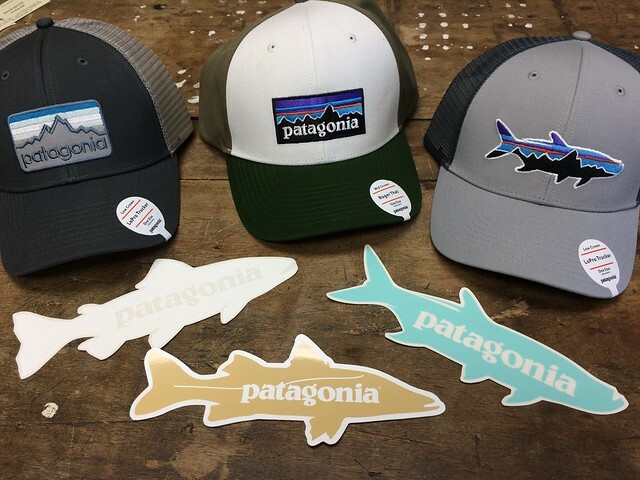 We have received a shipment of Patagonia gear at Backwater Angler! I am going to focus on the gloves, since it is that time of year after all. I have used the fingerless homepool gloves the past two winters. They keep your palm and fingers free whilst the 2.5mm neoprene keeps your hands nice and warm. The touch of your palm on the cork and line allows you to detect subtle takes when fishing delicate nymph rigs through the winter months. When arctic air pushes into the Great Lakes, frozen fingers and numb hands send most anglers to the couch. But the fish are still there. With our toasty R1® Gloves, your hands stay warm and nimble even in icy wind and lake-effect snow. The thin, flexible 1.5mm smooth-skin neoprene outer stops wind and shrugs off moisture, while the fast-drying 100% recycled polyester lining locks in warmth. Three-panel, stitched-and-glued construction with anatomically placed seams provides remarkable form-fitting comfort, dexterity and durability. This entry was posted in gear, news on November 26, 2017 by Theaux Le Gardeur. Happy Thanksgiving! Save 15% on Guide Trips Gift Certificates for 2018 Purchased this Weekend! The shop pictured above and below will be closed Thanksgiving week from Tuesday through Thursday and will reopen Friday from 10 till 5 and this Saturday and Sunday from 10 till 4. We are especially thankful this year for our customers that support the shop. Working in a job that allow us to take a walk along the river before, after and sometimes during work is something we’ll never take for granted. Without your support we would not be celebrating our 17th year in 2018. Call us during shop hours on Friday, Saturday and Sunday and save 15% on any fly fishing guide trips that are paid in full. We will issue a gift certificate redeemable for a guide trip to be taken during the 2018 season on the Gunpowder. Finding a day to go fishing with us next year is up to you! This entry was posted in news on November 20, 2017 by Theaux Le Gardeur. We have just received a shipment of Fishpond gear to Backwater Angler! Fishponds range of gear is comfortable, practical and built to last. Furthermore much of their fabric is made out of recycled industrial nylon waste turning it into quality products. Much of the success of Fishpond’s innovative products is attributable to the passion that we share with our loyal customers for the outdoors and the habitat that drives our inspiration. Together, we practice responsible stewardship and believe that every small act counts. We call it the “Ripple Effect”- the collective impact of individuals performing in an environmentally conscious manner and leading to lasting change-in thinking, in deeds and in results. Fishpond is looking for ways to reduce our footprint on the environment, and with this new line of products made from 40-100% nylon recycled commercial fishing net, an industry first, our customer can participate in the process of inspiring others about the importance of a sustainable planet. Conservation of our natural world is a shared responsibility. With each step forward, each new ripple we create, we move closer to becoming a brand that embodies a vision for a healthy and sustainable environment. As in every facet of life, none of us can do everything, but each of us can do something. Fishpond’s nomad nets are some of the lightest, strongest nets on the market, with a range of handle lengths to cater to your netting requirements. This entry was posted in gear, reviews on November 18, 2017 by Theaux Le Gardeur. The Gunpowder is 40 cfs at falls road and temperatures remain around the 50 degree mark. November has brought chilly temperatures finally and some needed rain. Swinging small streamers or wet flies such as hares ear and royal coachman has made for very good fishing in the riffles and runs. Fish that are on the lookout for an opportunistic meal tend to be tight up against the banks. When targeting these areas, focusing on making shorter more accurate casts will produce more solid hook ups. This entry was posted in fishing report, news on November 9, 2017 by Theaux Le Gardeur. The Gunpowder is flowing at 40cfs and water temperatures range from 49 degrees to the lower 50’s by midafternoon. 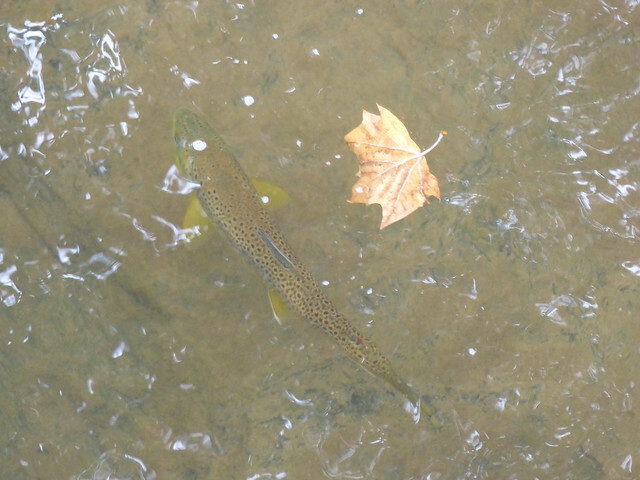 The Gunpowder has been fishing well, especially with dry flies. The surface action being the best between Falls to York road. Streamers and nymphs tend to be more effective above falls road in the boulder pools and in the faster riffles and runs. A simple elk hair caddis size 16 is a solid choice from mid day through to the evening. Soft hackle wet fly patterns like partridge and yellow or orange imitate the emerger well. Whilst the caddis hatches of tend not to be concentrated but spread out meaning the regularity of their presence keeps opportunistic trout on the lookout for them. 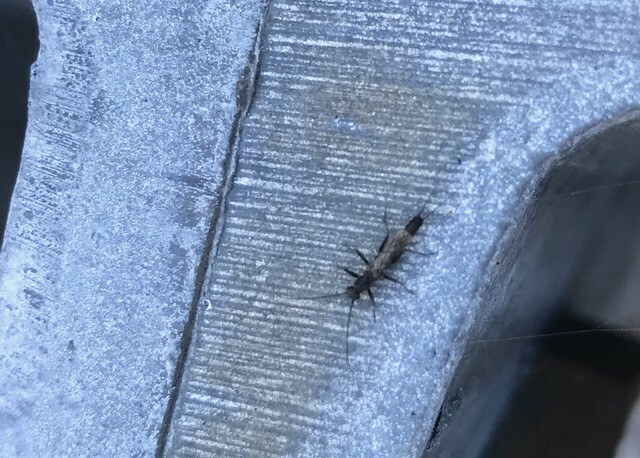 Fishing with midges has also been productive, particularly in morning or evening, size 18-22 red or olive zebra midges imitating their drifting pupa and 20-22 snow flies imitating the emerger well. Griffiths gnats are always a great-go now of year of year. Everyone should spend time outdoors enjoying this beautiful time of year whilst it lasts! This entry was posted in fishing report on November 2, 2017 by Theaux Le Gardeur.